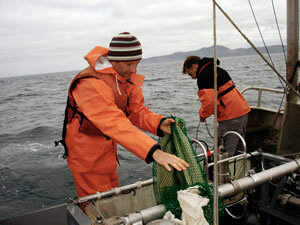 Lorenzo Ciannelli crosses the deck of the R/V Elakha with a fist closed tightly over his prize. “This is what we’re after,” he says, spreading his palm to reveal a half dozen flat fish pulled from the trawl net, each slightly larger than his thumbnail. Skimming across Yaquina Bay in the research boat, Ciannelli, an Oregon State University associate professor in the College of Earth, Ocean and Atmospheric Sciences, is searching the seafloor for this slippery treasure. The tiny English sole are semitransparent and pour out of the trawl net in dozens, along with droves of scrabbling juvenile Dungeness crabs no wider than a half-dollar. The fish Ciannelli collects are analyzed in multiple ways to help him build new understanding about the effects of hypoxia, the reduction of dissolved oxygen in aquatic environments that often occurs as a result of pollution, in bay and ocean settings. And to get that information, he has to do more than just catch them. In addition to processing the samples in his lab, Ciannelli reviews video of the English soles’ activity on the seafloor as they are snapped up by — or dart away from — the trawl. To expand scientific understanding of that environment, Ciannelli is combining visual observation with chemical analysis to quantify the health and energy stores of the fish. The lower oxygen levels of hypoxic conditions, often caused by pollution, can sap marine life, leaving them with depleted lipid (fat) stores and resulting in lower growth rates. With this research, Ciannelli hopes to learn more about how hypoxia is affecting fish and to help determine whether conditions in the bay or open ocean are more favorable for growth. “We want to find out which of these environments, the bay or the ocean, functions better, and it may very well be that it’s the bay one year and the ocean the next,” Ciannelli says. While adding clarity to scientists’ understanding of the effects of hypoxia in bay and ocean habitats is part of Ciannelli’s immediate goal, he says his work isn’t just about answering one question, but expanding the field of knowledge as much as possible. To explore his questions about marine habitats, Ciannelli has constructed a network that stretches from his office on Oregon State University’s main campus in Corvallis, to its Hatfield Marine Science Center in Newport and out across the water to his research on the R/V Elakha. At Hatfield Marine Science Center, Mo Bancroft, a graduate student studying marine resource management, is furthering Ciannelli’s investigation with an arrangement of 18 round tanks. The tanks are connected to a pipe system that pumps a specific amount of liquid nitrogen into each, and in every tank are 10 juvenile crabs and 10 English soles. Bancroft is examining the effects of different water temperatures and oxygen levels on the growth of the fish and crabs. Tanks vary in temperature from 7, to 10, to 13 degrees Celsius. Controlled amounts of liquid nitrogen work together with bioballs — white plastic spheres covered in spikes — to scrub oxygen from the water, creating hypoxic conditions in some tanks, while others have higher oxygen content. What it will tell them, Ciannelli says, is how these different environments affect growth in specimens under regulated conditions. Bancroft has marked all the fish with uniquely colored and located tags, and the crabs are in individually tagged containers within the water, allowing him to make direct comparisons for changes in each one. While Bancroft observes live specimens, University of Miami student Kathryn Doering is analyzing the freeze-dried sole Ciannelli brings back from his trips on the water. Doering, a junior studying marine science and biology, earned a place on Ciannelli’s team for the summer through the NSF-funded Research Experiences for Undergraduates program. “I applied here because Oregon is really far away from Florida, and I was interested in seeing how they were ecologically different,” Doering says. 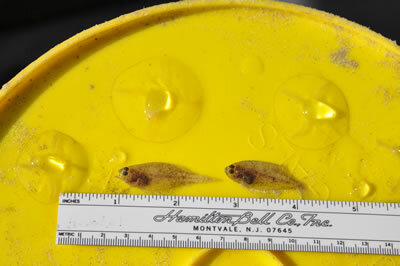 Doering has spent time on the ocean sorting fish alongside Ciannelli, as well as in the lab on campus using chemical processes to analyze the English sole samples and quantify the results. Information such as the amount of lipids in the fish — indicating whether they have fatty stores to draw on — are suggestive of how healthy the fish are in their environment. Whatever the results of his study, Ciannelli is sure to continue probing the seafloor for knowledge. As the project continues to develop, he hopes to use collected data to begin making predictions about the animals’ growth rates. That information, he says, could impact how the sole and crab are fished — or protected. “Crab and sole are commercial species, so where we find the best growth habitats could have practical application, and if we want to preserve them, it can tell us which habitats we should protect,” he says. Ciannelli’s passion for marine biology keeps him coming back to these questions, but he says one of the most enjoyable aspects of conducting research is working with great people.